In 2012, a multi-published writer received an email from an avid fan stating that a recent e-book contained a scene that was strikingly familiar to one found in one of the author’s out-of-print books. The shocked author soon discovered that the e-book in question was, word for word, plagiarized from a romance novel she had written fifteen years earlier. The e-book of the writer’s novel had been stolen, slightly modified, and republished under someone else’s name. Stories like this used to be uncommon, but Self-Publishing Relief has noticed that with the rise of the digital book marketplace, plagiarism has become much easier to perpetrate—and anecdotal evidence suggests occurrences are rising. If you’re self-publishing an eBook, one of the choices you’ll make when uploading your e-book onto an online vendor is whether or not you want to include Digital Rights Management (DRM). If you’re worried about plagiarism, DRM is the way to go. DRM restricts the ability to copy a digital file (such as an e-book) and controls ease of access, sharing, and conversion. Without DRM, it’s much easier and faster for a plagiarist to obtain the original proofread file to modify and republish as he or she pleases. With DRM, digital thieves have some hacking to do. DRM can be hacked, but its presence acts as a deterrent. Important Note: Keep in mind that enabling DRM may in some cases limit legitimate sharing of your e-book, and once you’ve enabled it, you cannot change your mind. Make sure you understand the pros and cons before you make the decision about DRM. U.S. law states that once you create an original work, you own the copyright for it. You can ward off the casual thief by including a copyright in your self-published book, but you may want to go one step further. 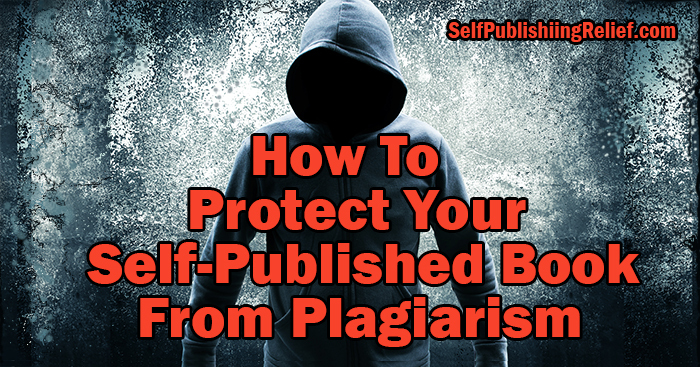 If you are plagiarized, it’s important to be able to prove that the material is yours. Saving the original files of your work is one way to give proof, but a far better one is to submit your copyright to the U.S. Copyright Office. It costs about $35 per submission, and as of very recently, you can upload digital files rather than mailing print ones. Registering for copyright has multiple benefits. First, if you have a certificate of registration, then you are the copyright owner without question. You don’t have to prove that someone has read your book and then stolen it. Also, if you bring a lawsuit for infringement against the plagiarist, you’ll be eligible for statutory damages as well as attorney’s fees if you’re registered. To combat the rise in online crime, search technology has been developed which makes nabbing the creeps a little bit easier. Google Alert. Automation makes monitoring easy. Set up Google Alerts for your author name and title of your self-published book. The alerts will go straight to your email. Keep in mind that you’re more likely to catch book piracy rather than plagiarism in this manner. A pirated e-book keeps your author name, title, and cover, and uses your book to lure visitors to pirate sites as click-bait—often with bad intent. You’ll want to get your book off the site as soon as possible. Google Search. Pick a short and relatively unusual phrase from the middle or near the end of your book—where many plagiarists will get lazy about modifications—and search for it on Google. Google will serve up snippets from the 25 million-odd books in its database, which include some in-copyright books. Make sure to put the phrase between quotation marks so you only get results that have the exact quote. Use An Online Plagiarism Detector. You can use a larger block of text for these online tools. Certain websites will check to see if your content has been used elsewhere. Check out copyscape.com, plagium.com, plagiarisma.net, and plagiarism.org. Sadly, it’s never completely possible to protect your books from copyright infringement, but if you’ve embraced these safeguards, you’ll be able to take action quickly, and have legal recourse if needed. Question: Have your books been plagiarized or pirated? Tell us your story!